If you’ve got a spare few minutes, or need something to do one afternoon during the Summer holidays, why not bake a special treat for your dog? These peanut butter biscuits are sure to go down well and are a lot of fun to make! Mix ingredients together well. Form into a ball, roll out to 1/4 inch thickness with a rolling pin. Cut into desired shapes (bone shapes of course! ), place on greased baking tray and bake in 325 oven for 30 minutes, or until browned. Turn off oven, leaving biscuits in the oven until cooled. These biscuits may be frozen, but keep well for a couple of weeks if they are very dry and crisp. 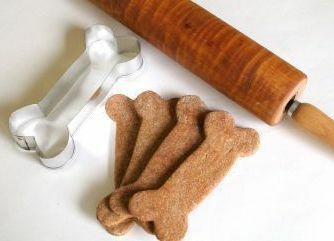 Why not email us a photo of your dog treats and we’ll put it on the website!